common SUBCOE Skid System is a single piece top lift, fully gated control room skid. The skid package comprises an EnerDRIVE VFD, Sinewave & IEEE519 filters and optional DOL Bypass system in an air conditioned control room with gated sections for step down and step up transformers. The skid system is fully integrated and is provided pre cabled with junction boxes and plug-in connectors for rapid well site mobilization / demobilization. 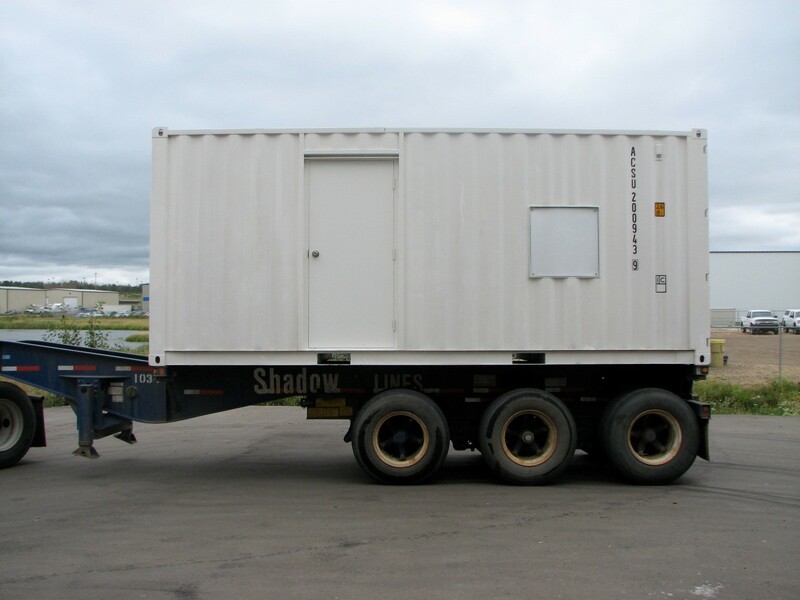 Our mobile skid package is a fully redundant integrated power system, we have manufactured in excess of 250 of these fully integrated skids for mobile and permanent installations. 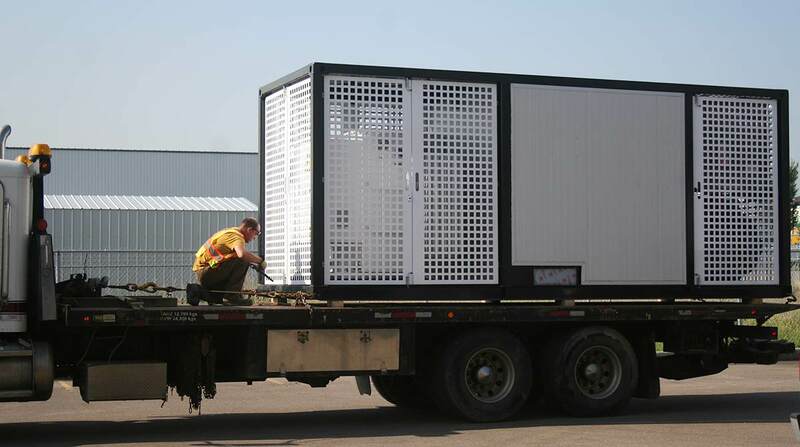 Depending on the location we often design our systems to fit into modified, fully certified ISO shipping containers, these contain VFD systems and transformers with forced cooling systems. We use two parallel power systems, on the front user panel of the VFD system there is a selector handle to choose between the YASKAWA VFD or a Direct On Line bypass system. Both come with our CUBE Intelligent Motor Controller installed and have a logical user friendly interface. Open Skids are manufactured on request using stand alone components, often including both step down and step up transformers. The individual components are all Nema 4 rated for 55C ambient temperatures and are mounted on a fully gated Oilfield Skid. This is less preferable for well testing as the operator does not have a control room to work from. 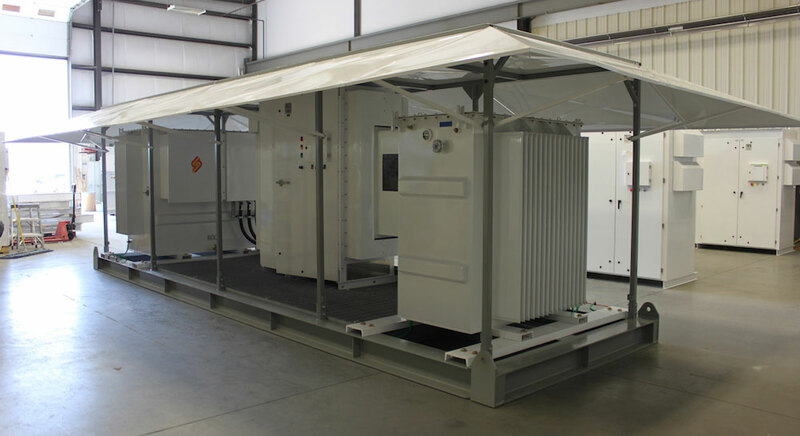 SUBCOE manufactures open steel skids and skids with sunshades then mounts and cables the complete VFD system on it, the scope of work may include all the well site transformers, the VFD and various other items such an as downhole tool, SCADA and aux power panels. For applications requiring the highest specifications such as those at Saudi Aramco we provide the necessary extras such as oil catch trays, gable roof extensions and increased structural rigidity.